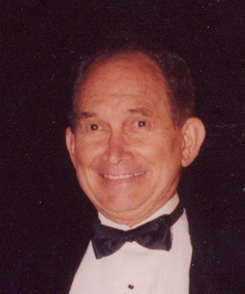 I was born in the Dee Hospital in Ogden, Utah on December 26, 1927. I was told that I just about was born on Christmas. This made for many comments as I grew up. Birthday parties on my birthday right after Christmas? No such luck. So many festivities going on in many places, who would come to a party so close to Christ’s birth? Hardly anyone! But it had its advantages. I always got more Christmas presents than most! As I grew up many of my friends invited me to their parties. Mother could hardly refuse when I asked her for a party in July. And it happened! My father, Leonard Sorensen worked for the Utah Power and Light Company as an electrician in repairing the high lines of electricity from Farmington to Paris, Idaho. I was able to work on the line gang during the summers to gain finances to attend BYU. The summer work was outside and I could take my shirt off and gain a tan while patrolling the lines and reporting broken insulators and also my cutting the brush around the telephone poles to prevent fires from destroying the telephone poles, thus causing shorting in the electricity. Sometimes the boss would get into a poker game with the men and we would have a longer lunch hour. My father always had a job and provided food for the table. I was never hungry. Most of the bills were paid, some on time. I especially appreciate his giving me a good spanking when I took some candy from Mr. Kelly’s store. I feel today that I could have been tempted to steal again, something else perhaps more valuable than the candy bars, and ended up in a lot more trouble. I didn’t get into anymore similar circumstances. So I guess the spanking was a blessing in disguise. My relationship with my father was one of disappointment. He drank too much and the effects of his addiction showed on my mother’s face when he would come home drunk most weekends. I will never touch alcohol in any form because of him. He was not the kind of father that showed any affection or encouragement. He taught me a most valuable lesson which has stayed with me ever since. Mother often worked in the canneries in peeling tomatoes. She was fast at it. During the war she worked at the Arsenal at Clearfield. My brother, Ferrell also worked there. I took care of the house and had supper ready when they came home. We had some chickens and some days I would take some eggs to the store to get candy in exchange. Since I just had one brother, my mind is fresh with thoughts about him. My mind reflects on a very special “snipe hunt,” in which my brother, Ferrell and his friend Willard Kidman participated. The location was in the middle of our street. The street was overgrown with weeds. We were told to take a sack and two sticks to click together. Then we were told to say, “here, snipey, snipey.” Expecting them to run into the sack we had provided. We stood there with our sacks and sticks for over three hours but no snipes! We returned to our home and found Ferrell and Willard on the front lawn laughing their heads off. The snipe hunt was thereafter told several times. Our family home was located in Ogden, Utah close to the mouth of the Ogden Canyon. There was always a cool breeze emanating from the canyon. Nights were cool in the summer and the winter days were colder but we enjoyed living there. Our home was rather small with only one bedroom until we added another room on the back of the house with an entrance down the basement. My brother, Ferrell and I had our bedrooms downstairs. For a while we had a trap door in the kitchen which was the only entrance to the basement until we added the second bedroom and basement entrance. I can remember sleeping with my brother only a short time until I was able to have my own room. I actually got a room with a door. My brother had one corner of the basement and I had the other corner. It was great when we got doors attached with the walls too. My earliest memories of home are centered around the coal burning stove. It was very cozy behind the chimney. It was my responsibility to keep the coal bucket full each night. My brother had to chop the kindling. Whether or not if you had a date, it had to be done! One night I forgot to get the coal bucket filled from the basement. Early the next morning, my dad woke me up and I had to get the coal for the house was cold! Now I can remember when we got a gas furnace and how easy it was to have a warm home! I also learned responsibility in doing dishes and cleaning the house. We never got any allowances. Our transportation at first was an open-air car which needed quilts or heated bricks to take trips comfortably. Dad never let me drive the car. My brother did when he got a car. He allowed me to take his car to the Rainbow Rendezvous in Salt Lake. He had a 35 Chevrolet. I was never embarrassed because of a car. I was grateful for the ride instead of walking. We walked most everywhere we wanted to go because mother never drove until I was in high school. My toys were not numerous, however, I had a toy soldier which was hollow inside and was filled with crayons. I loved to color with the toy soldier who had a hat that rotated around his forehead and you would push it. The book begins with a questions: “What did you enjoy most as a child? I really enjoyed playing the piano and singing until my dad came home. He didn’t appreciate it. One thing my dad always said was, “lay off the piano!” Maybe I played too loudly. Consequently, any practicing I did had to be done when he wasn’t home. It is a wonder that I accomplished anything at all because of him. Later on when I could play and sing for company, he still never gave me any support or encouragement. I can’t remember him ever saying anything complimentary or encouraging to me even when I went on a mission, graduated from BYU or received a Master’s degree. My mother was a great one to nurture my talents. She paid for my music lessons in voice or piano. She encouraged me a lot. She also played and sang which was an incentive to me. Sometimes when we did the dishes we would harmonize in singing songs. She was an inspiration to me. I enjoyed taking care of the flowers. We had a lot of roses and lilacs. Mother helped me and we did it together in making ditches for the water to irrigate the plants. I would kneel and make the ditches for the water to irrigate her many rose bushes. We also sang as we did the ditches. I loved going swimming at night. I would ride my bicycle down to the pool and go swimming by myself. To ride back home with wet hair was really refreshing! I would try and do one more lap each time I swam. There were times when Bill Nash and I would go swimming in the Ogden River at night. Playing baseball was in our neighborhood and was a lot of fun. We played baseball regularly. Doug and Janet Stewart who lived next door played regularly as did Helen Fleming and the Murdocks. We played in a vacant lot across the street from our house. Also, “Run, Sheepy Run” and “Kick the Can” were our favorites. In going to other ball games there wasn’t much money to buy snacks after ball games. I do remember going to San Francisco to see the Oakland As play. There we bought hot dogs that were great! My parents gave me my name and I don’t know any of the details. I also had plenty of nicknames, some of which were: Moo, Curly, Nu Nu, and Sorney. My mother was the epitome of love. Since my father was addicted to alcohol, during my childhood and in fact all of my youth I could not have coped with the ups and downs of life had it not been for her. She was always there! At a very early age I can remember the smell of homemade bread when I came home from school. She was always involved with others, serving them in any way possible. She was regularly involved in quilting. Our front room was big enough to allow quilting frames to be connected and very often Mother and her 4-5 sisters would be grouped around the quilting frames when I came home from school. My attitude has developed since I was young. It hasn’t changed but developed. I was about 7 years old when Mother had an attack of appendicitis. She was in terrific pain but got some relief rolling around on the floor. I thought it would hurt more but she did it. Mrs. Lakin across the street came over and taught me how to kneel down and pray. I don’t remember if she ever went to church. She helped me to pray and when Mother went to the hospital the doctor said her appendix had NOT ruptured. I felt then and now that God was with her and He still helps and blesses me and my family. I felt most definitely that he loved me and mother. She recovered nicely. Her sisters were also great members of the church and had strong family ties between them. When any one had a trial, it seemed that everyone was there to lend support and love. I can remember when her father passed away. The viewing was done in homes then, not in the mortuary. Each time there was a death it seemed mother was the first one there lending support and strength. Her sister, Lillian lost two boys due to a train accident involving their son’s car. I remember going to the hospital and kneeling by the bed of Neldon. I would breathe loudly to help him breath regularly. I was there a long time on my knees and I have felt since that if I had been allowed to continue to breathe with Neldon until his was strong, he would be alive today. But the nurse came and I had to leave. At the funeral I can still hear Lillian scream out loud at the loss of her two sons. In the LDS Church you become a Christian when you are baptized. It is done by immersion. 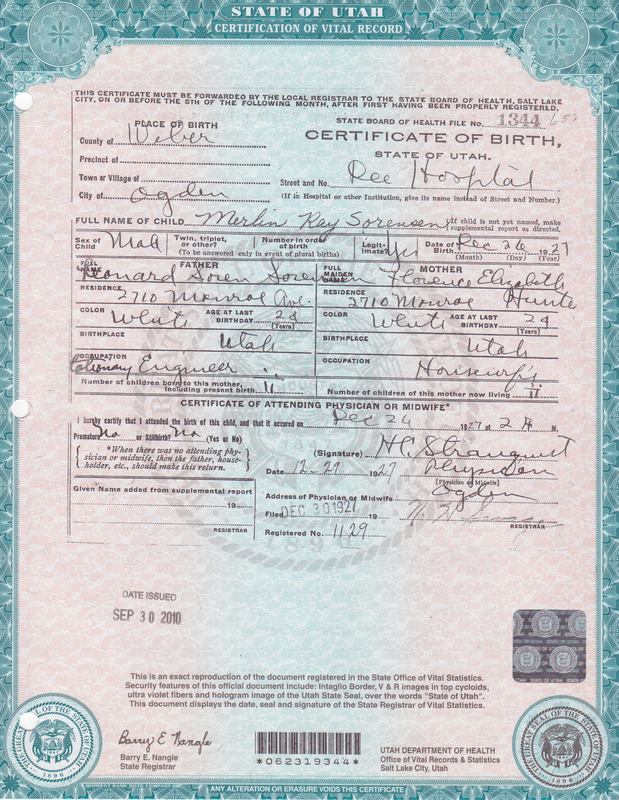 Since the church does not believe in infant baptism, I was baptized when I was eight years old on December 6, 1936 in the 21st Ward in Ogden, Utah. I didn’t receive any lessons prior to being baptized. I envy those that are taught specifically in order to become baptized. I remember it was very cold in Utah and no one told me to take an extra pair of underwear. So after the baptism, I rode home in the bus rather chilled. I don’t remember any friend or family member going with me to be baptized. In belonging to the LDS Church, the communion is actually partaking of the Sacrament. I have partaken of the Sacrament all of my life and believe it to be very important and basic. I was somewhat surprised and saddened when I learned some churches teach that the bread turns to Christ’s body and the wine turns to His blood. Isn’t that absurd? Keep His commandments to remember His sacrifices for all of us. My parents did not attend church regularly. If we had company, we didn’t go either. I feel like going to BYU gave me the desire to attend my meetings and try to gain a testimony. I had attended BYU before I ever attempted to bear my testimony in my own ward. I owe a lot to BYU for the strength and conviction I gained there. I hope my children and grandchildren will attend there also. My grandparents were great from what I learned, but I had very little opportunity to be with them. One weekend I had breakfast with Grandfather Hunter. He made me waffles and I really enjoyed it very much. The syrup was especially tasty. Grandpa Hunter died when I was about seven years old. We were at his bedside and he would turn to the wall and talk, possibly to those that had passed on, then he would turn to mother and her sisters and talk to them. Soon he passed on. As a child, I can remember walking home from most things and the shadows of the telephone poles moved as I passed them. I thought someone was behind them. Usually I would run from pole to pole. I finally grew out if it! One day Harold Smith and Jimmy Flygare wanted to meet me at Kelly’s Store at noon. Mr. Kelly would usually go next door to his home for lunch and leave the store unattended. I met my two “friends” in the store. When I got there they were filling their pickets with candy bars. I assumed that they had made some arrangements with Mr. Kelly so I did the same. When we finished filling our pockets with candy, we left the store and proceeded up the street to our homes. Sooner than anything, we saw Mr. Kelly driving in his car and stopped and said: “Can I give you fellas a ride?!! We all climbed in his car and he stopped at the other two boys’ homes, but with me he took me up to the door. When my father opened the door he said, “Will you please tell your dad where you got those candy bars?” My dad took me down to the basement and took my pants down and said, “Would you like to steal me some more candy bars?” “Are you sure?” “Are you damn sure?” In between each swat, he would emphasize the point. I feel today that that correction was a permanent one and has lasted my entire life. Animals were a part of our life. My dad had a hunting dog, called “Prince.” He wasn’t playful or a “kid’s dog.” I would have loved to have had such a dog. I did have cats, though. Jennifer is the only one I can remember. She was pure white and one day in Autumn, I decided she needed a bath. I got her all sudsy ad almost ready to get out of the tub. Mother called for supper and I went in the house. We had supper and I was assigned to do the dishes so I didn’t go outside anymore. In the morning Jennifer was dead. I cried all the way to school. On the way to school I also saw some high school boys throw a cat into a man hole. My teacher comforted me as much as she could. I can still remember my mother’s cooking. She was an excellent cook! Lemon Meringue Pie was my favorite as was her cherry pie. She made a great date-nut pudding. Goulash was also something special. I couldn’t duplicate it, but it was made with hamburger, peppers and I think macaroni. She also made bread and when I came home from school, I used to have homemade bread, peanut butter and jam! She canned peaches and raspberries so I could eat a whole bottle for a meal. My favorite was Paradise Pudding with pineapples and crumbs. I hardly ever got in a fight. I remember once in the park someone would put a chip on someone’s shoulder. If someone knocked it off, a fight began. I was very easy going and got along with everyone! My favorite work outside is working with flowers. I enjoy trimming them, making bouquets and taking them to people. Mother really appreciated it when I would clean the house and put flowers in a vase. Another job I had was when dad would bring home a telephone pole Ferrell and I had the assignment to saw it into 12 inches for kindling to heat the house. I hated the work but while doing it I would sing songs and develop muscles while sawing. One way I like to spend at leisure was to take a long shower and being naked and getting dressed. I enjoyed sun bathing with or without clothes. I want always to take care of my body. Being clean and smelling clean has always been important to me. After all, God said our bodies are temples and we should take care of them. This also means do not take anything like alcohol or tobacco and drugs into our bodies. Because of my background and Dad’s addiction to alcohol, I will never have that problem. I saw the effect of alcohol in the family. It was often enough that the temptation will never be a problem. Because of this strength, I gained a lot of spiritual strength from it. I would to have more spiritual experiences. I love the feeling when I know my Father in Heaven is a guiding person over me. When I teach a class in the church I am sure things come to my mind which make a lesson better. Sometimes when I sing I feel like the words come readily to my mind. When it comes to employment, the first job I got was with Kress Stores as a stock boy. I would bring additional merchandise from the stockroom upstairs to the counters downstairs. I felt very important because Kress Store was a big store. I swept in front of the store with a big push broom. The boss even showed me how to do it. I don’t remember how much I was paid but that is when I got my social security number. My memories are very full of activities including water skiing, snow skiing, roller skating and bicycle riding. I can’t remember when I didn’t know how to ride a bicycle. Most of the places that I wanted to go to was done by bicycle. While at BYU we stayed with a family on tour and after the concert and breakfast the next morning they asked me if I had ever water skied. I had the chance in Florida and had one wonderful time skimming across the lake there. Snow skiing was a part of my teenage years with Bill Nash and others at Snow Basin. Roller skating was done occasionally. I never could skate backwards or dance on skates. I did enjoy sailing. It was part of the Explorer Program of the Church and we enjoyed this at Pine View Dam. My farming experience was had in Brigham City. My Aunt Lenore and Uncle Gid had a farm and I enjoyed going there for a weekend. The food was very special that of meat canned with spices and roasted. They had a great garden and we had strawberries very often. I gathered the eggs. One time I lowered the covering of the nest and saw a hen lay an egg and I saw it come out! Jumping on the hay and playing in the barn or riding the horses, bringing the cows back to the coral was especially great. Also, cooking potatoes in a bonfire was a good experience. Hobbies are an important part of our lives. I guess climbing in trees and making tree huts was my favorite and jumping up and down on the branches and feeling the swinging going up and down. I enjoy swimming a lot and went often at night all by myself. I enjoy cleaning my room and making it comfortable and attractive. Pranks were not a part of my childhood. Once when a friend of mine got married we wired bells on the mattress where they spent their honeymoon. He is still my friend however, and he didn’t get angry with Bill and I who did it. Television was not possible when I was young. My favorite program after I was married was Sunset Strip, Hogan’s Heroes and Mission Impossible. I also like military movies. I guess I like military movies because they gave me a deep feeling for patriotism for my country. Fads were prevalent in high school. Peg-leg pants were a fad in high school as were shoes built up. I wore those like most boys. Cream-colored cords were also very popular. Friends would write their names on your cords. I didn’t have too much money to participate in other fads. Club houses were a part of my life. I didn’t have one as a child, but Russell and David and I built one outside the washroom of our house on Loma Verde Way in a tree. I got a recording or some battle sounds and put the recording by a window plugged in and they with Paul Ogden and others would play soldier outside the house in the tree house. Finances were always a problem in our home. I never had an allowance. Since dad drank too much, the family funds were always strained. I remember going to the front door very often to tell creditors that Mother didn’t have the money to pay their bill he was expecting. I don’t ever remember being hungry however. Mother was an excellent cook and manager. As a teenager, I never rebelled to my parents. My brother crossed Dad once and got knocked off his chair. I never did anything that caused Dad to hit me. I was always obedient out of knowing the consequences. I never regret being a good boy. I am proud that I was never obstinate or stubborn. Mother brought out the love to me and gave me dad’s share of love and confidence. I wished that I would have worked harder to get better grades and possibly practice more in music, but I felt good about my success and happiness as I grew up. Performing occasionally for people and making my parents proud of me, especially Sam and Millie Burch, who were friends of the family. They really praised me. Our activities as a family were seldom but enjoyable. 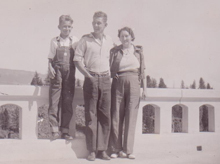 One especially, was a trip to the canyon with Aunt Lillian and Uncle Floyd Rawson. We did enjoy the picnic and fun. We took pictures and laughed until it hurt. I can still remember going over bumpy roads and people saying hold your stomach because of laughter. Mother and her sister, Lillian were very close. In my childhood there hasn’t been any fears that have haunted me still. I trust in God and He has always been close. When leaving the Salt Lake airport for Korea I was somewhat apprehensive, but I prayed that I would never be alone, because of the discouragement that comes from that. He was always there. Mother liked music and liked to sing and play the piano. I liked it too. She was so patient and loving. I try to be that way too. She was always busy and I don’t remember her even wasting time or complaining except about Dad’s drinking. I had a very terrifying experience when I was about 12. Dad had been drinking and was too drunk to drive us home. He had been in a pool hall and another man came to our car and drove us home. I rolled down the window so I could scream if I needed. Luckily we got home safely. When Dad drank I was especially frightened when I saw the bruises on mother’s face. In looking back over my life, I would have enjoyed being closer to my brother. He was older by two years than I and his friends never became my friends through no fault of mine. I would also have wished somebody would have taken an interest in me and teach me more scouting skills so I would be a better leader. My education along mechanical lines or carpentry skills never was possible in my youth. I wished it would have been different, but no one made it seem worthwhile for me to make the effort to do it. My dad never took Ferrell and I on any side trips. 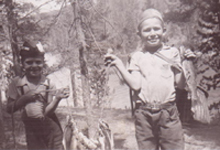 The whole family had unfulfilled fishing trips in which time was wasted setting up camp because Dad would come back to camp saying the fish weren’t biting so we went home. My most satisfying memory was during the war when both parents worked and Ferrell worked also. I was left to keep the house in tip-top shape. I was satisfied that I could do it and did it well. Even the washing the clothes was a snap. Sometimes getting the clothes out on the line ahead of Mrs. Stewart was a very satisfying blessing. Making Dad, Mother and Ferrell’s lunches was never a chore. I wrote little notes and put them in Mother’s lunch each day and was really gratified when Mother brought a friend home for supper. The lady said, “So this is Merlin!” I can still envision the look in her eyes as she saw me. That was payment enough for my work! My fondest memory of a Thanksgiving dinner was on in which my dad said the blessing on the food. He had been drinking and in the middle of the prayer, he stopped and cried! I hope it was a sign of his true repentance. I am most thankful for the sweet, kindness and loving care from mother. I never did anything really wrong, except with some candy bars which I explained earlier with Mr. Kelly and the store. She was always there for me with her love and support. The winters in Utah were cold! Sometimes the snow was three feet high. One day my brother and I made snowmen and a fort in the front yard. We had a good time. Later, we took our sleds down at the park where there was a good sliding hill. It was very ice and coming down the hill my sled went out of control and I crashed against a tree and was unconscientious for a while. I recovered well.